How Does A M'sian Social Enterprise Get Robots And AI Onto Its Food Truck Fleet? 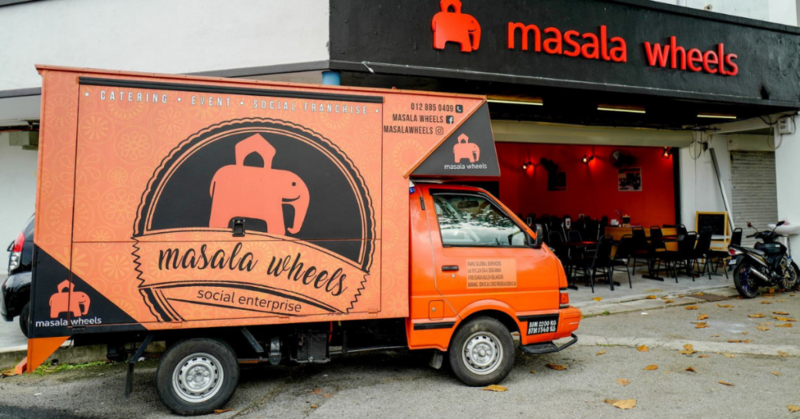 We catch up with Masala Wheels to talk about their growth as a social enterprise, their latest equity partnership with KCOM Group, and the development of social entrepreneurship in Malaysia. The last time we spoke to Kuhan Pathy of Masala Wheels, his social enterprise project was barely a year old. At the time, Masala Wheels was all about raising funds through the sales of their Indian cuisine through their food trucks—they prepared and sold food at considerably affordable prices and then donated the earnings to underprivileged communities. But since then, his enterprise has evolved to become more than just an avenue for raising charitable funds. Since late 2016, their main focus has shifted towards helping members of underprivileged and impoverished communities upskill themselves through actual work experience. Providing them opportunities to work with in the F&B industry, individuals and groups from these communities could earn income while also learning how to run a food business (cooking, catering, overseeing operations, etc). Within the past couple of years, Masala Wheels have also gone on to receive awards including The Star Golden Hearts Award and the Perdana Young Indian Entrepreneur Award for Social Enterprise Excellence, and have also managed to grow by 100% after concluding their stint with Malaysian Global Innovation & Creativity Centre’s Impact Driven Enterprise Accreditation (IDEA) accelerator last year. 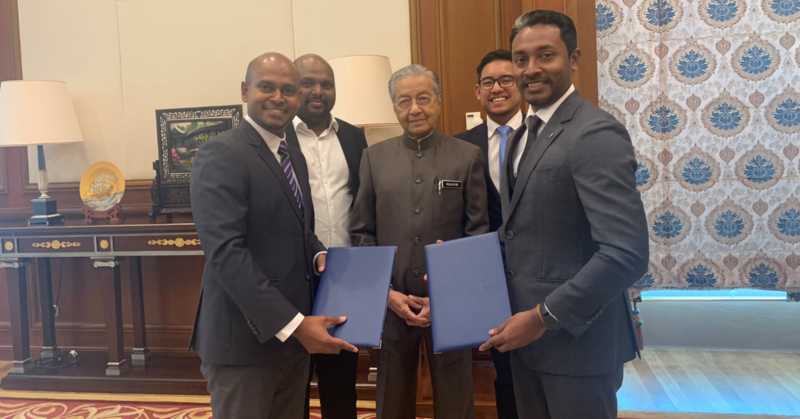 Now just at the beginning of February 2019, Masala Wheels announced another significant development—an equity partnership with Rubaneswaran, CEO of KCOM Group witnessed by Tun Dr. Mahathir Mohamad to help scale up their operations and reach even more underprivileged communities around the country. For the unaware, KCOM Group is a Malaysian digital solutions provider that places a strong focus on developing for IR 4.0 with an emphasis on corporate social responsibility (CSR). Since their inception in 2014, many of their digital transformation endeavours have been linked with the improvement of underprivileged communities. Through the partnership with KCOM Group, Masala Wheels will now focus on creating an automated kitchen that will provide technological exposure to these communities in addition to their current constructive endeavours. This automated kitchen will also employ a digitised artificial intelligence (AI) platform that will help improve consistency and enhance their deliverables by tailoring offerings according to customer interests. Additionally, Kuhan also revealed that Masala Wheels would also through this agreement venture into providing digital education for underprivileged kids, with meals to be provided for free. Sharing his view on educating youngsters, Kuhan stated his belief in addressing fundamental values at a young age, especially those from more underprivileged backgrounds. This equity partnership comes coinciding at a period where Malaysia is seeing more recognition for social enterprises and causes. Malaysia’s Ministry of Entrepreneur Development recently set up a Department of Social Entrepreneurship to act as a catalyst for more similar projects and undertakings locally, and the Ministry of Finance also announced specific tax incentives in Budget 2019 for the purpose of driving private entities to invest into social enterprises. This is in stark contrast to years ago when social entrepreneurship was only recognised in regions such as the United States and the United Kingdom. Kuhan hopes that this partnership will set a precedent for social enterprises and spur on more investors to take an interest in such businesses. To know more about Masala Wheels, visit their official website or Facebook page.